Saturday. After spending yesterday bird watching which means a bit of walking and lots of standing and looking, we opted to try for more of a hike today. We went peak bagging! Took a short hike to a peak. Was nice to get above the canopy and see the countryside. It seems like the jungle is held together with roots. Hanging roots and so many tree roots that they make nice steps. The peak was 760m (2500 ft.). Mt. Mulawella. On the way down our guides stopped us for a while and with an MP3 player, played bird songs. 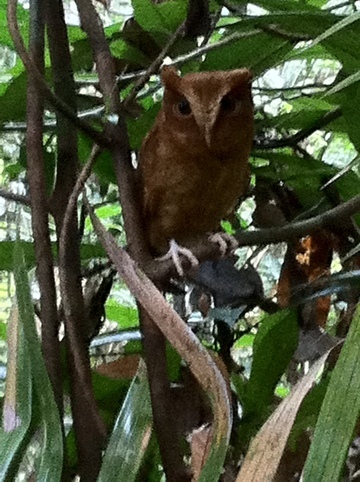 After about half an hour they found a small rare owl, named serendip (photo below). Our local forest guide charged about $10 per day. Not much by our standards. From the little we’ve seen Sri Lanka doesn’t look that poor, but with wages like that it is. Seems to be a good bus system. Many busses even in the country side. Women wear both western clothes (jeans and blouses), shirts and blouses, and dresses. Not the same styles as California, but maybe would not look out of place in the Applachians. Eomen also wear saris. Men wear western clothes and many wear sarongs, more so in the country side. The mens sarongs are colorful—woven large plaids, solid colors with wide borders. The lengths vary from knee to floor. Short more for work and long for dress. Good because they’re cool. Found out that the low temperatures we had a couple of days ago were the lowest for the day in 61 years, about 20*F lower than normal. Getting warmer now. Driving through the countryside, it’s surprising how many people there are, frequent villages, tuk-tuk running back and forth, seemingly buses every few minutes. And in one area dense with tea plantations, many private cars—mostly compacts. I’ll have to sort out the two Buddhist groups. Anyway, the Sri Lanka form is the same as Thailand—no prayer wheels and not many flags. The long running war with the Tamil Tigers was ended a couple of years ago. But the taxes have gone up since the war. The taxes increase the prices by as much as three fold according to our guide, but by observation not true for everything. Some of it goes to infrastructure and supporting the environment, but also apparently to lining the politicians pockets. Still writing this a couple of days later. We’ve seen several electrification projects. One gets the impression that most of the country is electrified. Our lodge at Sinharaja had a water small turbine generator, but power lines were being put up nearby. Cell phone coverage wide spread as elsewhere in the emerging world. Last two nights stayed in a hotel used in the Bridge Over the River Kwai. And yesterday visited the site of the bridge used in the movie. The bridge is gone (it was really blown up for the movie), but the abutments are still there. And it really is jungle. Thick vegetation. Hot and humid even in winter. Misty mornings. Not much rain here now. Although we’ve heard about the major flooding in the northern part of the country—forty days of rain. We don’t think it will affect our planned trip, although we still have to recheck our northern most destination. Off the grid today and tomorrow for sure. Alreeady Friday afternoon and we left Monday morning. We apparently arrived in Colombo Wednesday mornining, Jan. 12. For the first week we’re traveling with Jewings Tour which is well regarded for their birding tours. Louisa and I aren’t particularly birders but we enjour tromping around in the woods and seeing birds. Anita who arranged the trip is a budding birder and this is her first birding centric tour. We spend the first night at Villa Talangama on a lake of the same name on the edge of Colombo. Beautiful house built as a private house, but now the original owners are B&Bing. Wonderful hoults. Both are retired, he was a construction project engineer and she a psychiatrist, both in England. Built their dream house on the lake. Excellent food. The Caplans, our driver-guide, UL and us did a little birding on arrival. The lake is more like a swamp with water buffalo and therefore cattle egrets, purple heron, and many other birds as well as mongoose and water mionitor (lizards). The weather started unseasonably cool, dropping to below 70°F at night. Thursday we got going at 7 to go to the Bodinaagala Forest Preserve which surrounds a Buddhist monastery. About 12 monks reside here. The monks take care of the grounds and meditate. They do have electricity and talk (many monks takes vows of silence). They do receive food and alms from their devotees. Instead of walking around a town or village, they come to building at the edge of the monaatery were people bring them a 10 a.m. morning meal. On the day we were their a family consisting of maybe three women, a couple of children, and a man had come to prepare a meal for the monks. They used a provided kitchen to prepare the meal. At 10 a.m. about 7 seven monks came down to the building with their begins bowls. They sat down in a line and received their food. All but one of the monks then left after some prayers (or whatever they are). The remaing monk conducted a service for the food providers and any visitors. Before it was over we went out to vied watch and tour the monastery which had building spread over tens of acres. We met one monk who we found out had been their for 18 years, and then talked to another monk (with our guide translating). The second monk was younger. He goes home once a year to visit his family. After some conversation he offered to perform a blessing and tied blessed strings on our wrists. We then returned back by the kitchen building and were offered lunch by the devotees. They had probably eaten after the monks left and were kind enough to give us lunch. And it was very good. Teh usual dahl and rice, but several good vegetable dishes and chicken. Their generosity and friendlyness proved what we’d heard about the Sri Lankans beign friendly and genreous. We then drove a couple of hours to the Sinharaja Rainforest, going by four wheel drive for the last few kilometers to Martins Lodge on the edge of the forest. Martin, a sixty of seventy something owner/host was one of the key players in improving the protection of the area which is now a UNESCO World Heritage Site. It was started in the 1870s, but has also been logged and used for other purposes, but logging has been stopped. Today we went our out on a birding walk with UT and another required guide. Between the two of them we saw at least 20 bird species as well as many flowers including orchids. After our deluxe first night we now in more pedestrian digs. But we do have power and hot showers, and we’re in a beautiful rain forest. In the air now. Just passed by St. George, Utah and Cedar Breaks. Lots of snow. The airplane is nice. We’re on Emirates with a layover in Dubai. If we’re not too tired we’ll have time to explore a little. Several inches of legroom compared to domestic flights and well equipped seat back, that is, well equipped screen and 110V and USB charging plugs. The plan is about half full which is a surprise these days. But this is a slow season. Hope to post this in Dubai. We plan to blog this trip which shouldn’t be too hard technologically, just have to make the time. I didn’t have the time or technology to post on the Nepal trek and didn’t finish writing up the trip, but I did cover more than half the trip and posted on our blog at http://knobby.ws. Links to photographs also from the Nepal trip are on the blog. I did screw up. The message to be sent after we arrived went out to half of our list. Oh, well. I clicked on the wrong button. One last minute hick-up was one of Louisa’s paper tickets was missing. The whole ticket had to be sent back to NY and resent back. Nail biting time hoping they arrive and are complete. Now the advantage of e-tickets is clear. We’ve heard from two people we met in Guinea last year. We should be meeting up with Aisha in Kindia a couple of days after we arrive. Not sure about Moustapha who arrives back in Conakry three days after we have come and gone. To hold over those that got the blog notice early, here are photos from our 2006 trip. We probably won’t be posting many photos until we get back.